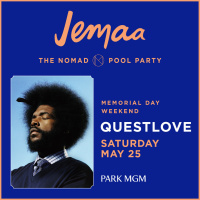 Everyone knows that when the temperature rises in Las Vegas, the pool party season begins. While Sin City has no shortage of amazing pool party hotspots, there’s a newcomer in town that is making a major splash. 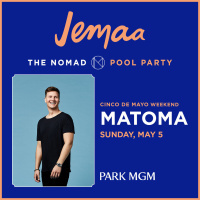 Normad Las Vegas at Park MGM recently opened its much anticipated Nomad Pool. Located on the third-floor roof deck of the boutique hotel, the pool party destination offers party-goers a fun and sophisticated escape from their daily lives. 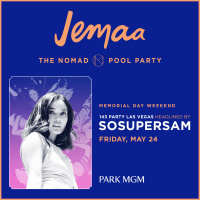 The NoMad Pool transforms into Jemma – The NoMad Pool Party, every Friday, Saturday, and Sunday so be ready to experience Vegas’ newest summer hangout. 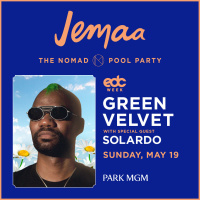 Jemma Las Vegas can be found in Park MGM, located at 3772 South Las Vegas Boulevard. The pool is open from 11 AM to 6 PM through the weekend, giving party- goers plenty of time to relax, socialize, drink, and dance. Monday through Thursday, NoMad Pool is also open to guests who desire a refined poolside experience complete with premium dining options. The tranquil pool environment is enhanced with a Poolside Café that offers casual fare, as well as masterfully-crafted cocktails and a wide selection of wines. Inspired by the Majorelle Gardens of Morocco, the pool scene is accented by scrumptious poolside snacks and creative frozen drinks. The pool, with its striking blue accents and plush furnishings, was designed by Jacques Garcia. The menu, which features delicious options like lobster roll, truffle chicken club, and fava bean hummus, was developed by restaurateur Will Guidara and Chef Daniel Humm. NoMad is already well-known for its table-side service, incredible tropical vibe, and roster of DJs and artists. 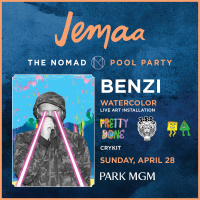 With the introduction of Jemma, NoMad is expected to be the go-to pool party spot this summer. If you plan on visiting Jemma, you’ll be happy to discover a wide range of services, including a cocktail fountain that can be delivered to your private cabana. 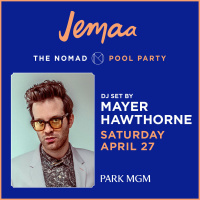 The NoMad Pool Party kicks off the 2019 season with an exciting lineup of DJs, including Mayer Hawthorne, Mark Ronson, and DJ Five. With its fun party atmosphere and nuanced music, the season is expected to be one of the best yet. Before visiting Jemma, there are a few things to know. First, locals with a valid Nevada identification card can enjoy complimentary entry into the pool before noon. 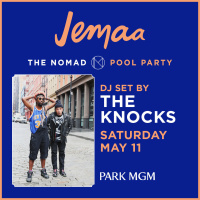 Next, know that NoMad will be hosting some incredible events throughout the season, including the Under the Stars at The NoMad Pool event which is expected to include an evening of surprises. Jemma Las Vegas is all about providing party-goers with impeccable services with a personalized touch. From the food and drink to the music and overall vibe, you can expect the upscale, fun, and wild atmosphere that Las Vegas is known for. The team that developed Jemma already has hospitality venues in New York, Las Vegas, and Los Angeles so you know you can expect something great. However, Jemma sets itself apart from all the others as it quickly becomes the new and best daytime destination in Vegas. 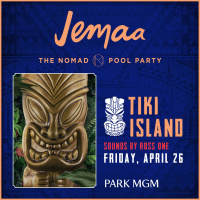 Jemma, The NoMad Pool Party, will officially open its doors on April 12 th . The seductive and energetic daytime experience takes reservations if you want to secure your spot. Walk-ins are also welcome. Jemma is a great option for singles or groups and parking lot and valet parking are available to all guests. If you are staying at the NoMad hotel, you have complimentary access to the pool. Other great perks you’ll discover at Jemma include waiter service and plenty of outdoor seating. 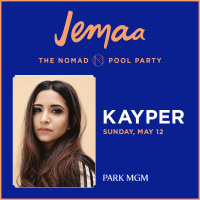 If you’re in the Las Vegas area this summer, be sure to schedule some time to visit Jemma at NoMad.